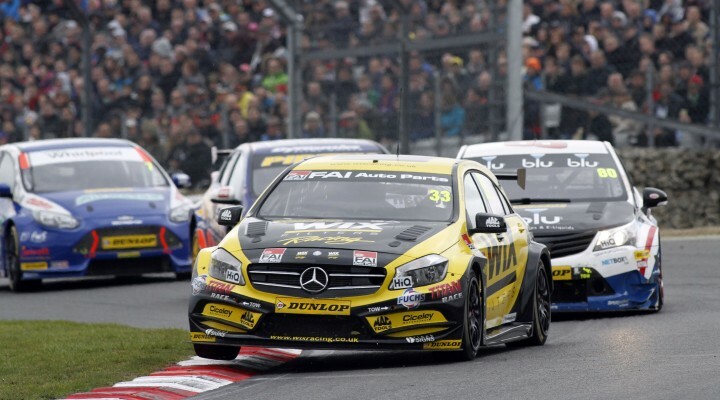 For the first time in the history of the Dunlop MSA British Touring Car Championship a Mercedes Benz has scored an outright race win as Adam Morgan claimed top spot in race two at Brands Hatch. While Morgan triumphed for WIX Racing, MG KX Clubcard Fuel Save secured the BTCC Manufacturers’ Championship after Sam Tordoff doubled his podium tally of the day with second place. Despite a spirited fight back drive from Honda Yuasa Racing’s Gordon Shedden, who surged from the back of the grid to finish seventh, it wasn’t enough to keep his squad in overall contention. It was yet another unforgettable Dunlop MSA British Touring Car Championship contest, which commenced with Colin Turkington blasting past the MGs and into lead. Double champion Alain Menu ended up in the barrier after losing control of his VW on the exit of Paddock Hill Bend, bringing out the safety car at the end of the first lap. The drama continued at the restart when contact between Plato’s MG and Turkington’s BMW left the latter in the gravel and out of the race at the top of Paddock. Airwaves Racing’s Mat Jackson took over the reigns but his lead didn’t last long after the multiple race winner spun it away of the exit of Hawthorns. Plato baulked up while Jackson was having his moment, allowing the eBay Motors BMW of Rob Collard to nip through. Changes for the lead were far from finished, however, after Morgan got past Plato before producing a stellar move by leader Collard at Paddock Hill Bend. Plato made it through too as Collard’s soft compound tyres began to drop in performance. The crowd were on their feet as Morgan looked set to take his and the first victory for the WIX Racing Mercedes, but unfortunately it wasn’t to be as an unforced error let Plato back past and into the lead. The double champion crossed the line in first place, but a post-race penalty for his move on Colin Turkington demoted Plato to 13th position. The final Dunlop MSA British Touring Car Championship race will take place at 17:05 with Nick Foster on pole position. Plato will start from the back of the grid after being adjudged to have driven inappropriately in the Turkington incident. He was given a ten place grid penalty and as this was his third penalty strike of the season it results in the immediate sanction of being moved to the rear of the order for the next race.